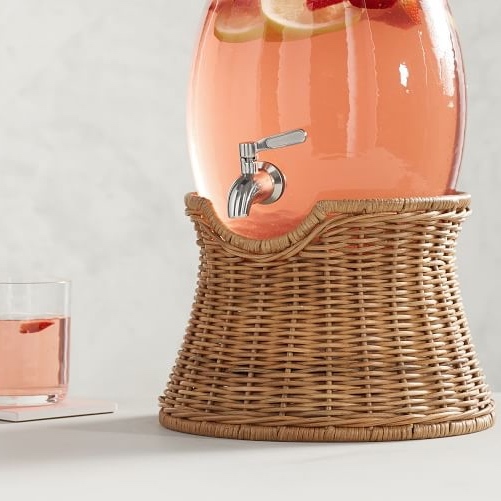 Is it crazy how crazy I am for this wicker drink dispenser stand??? OMG, I can't even. Here's what I love about it: it's wicker. Also: it's a drinks dispenser stand. And, the reason that is all so lit is because, have you tried to find an attractive drinks dispenser stand? Ain't happenin'. Until now!!!! I love wicker on a summer outdoor table. And, that's when you want to be busting out your drinks dispensers, anyway. Am I right? Maybe it's a Southern thing. Or maybe it's an entertaining nut thing. Either way, a party is easier when you have a couple of drinks dispensers for iced tea, water, and/or a batch cocktails. Add rows of highballs lined up like soldiers, a cup full of colorful straws, your super chic cocktail napkins and you have a professional party planner sitch on your hands. Imagine using these Aerin Wicker Hurricanes, and maybe these chargers? 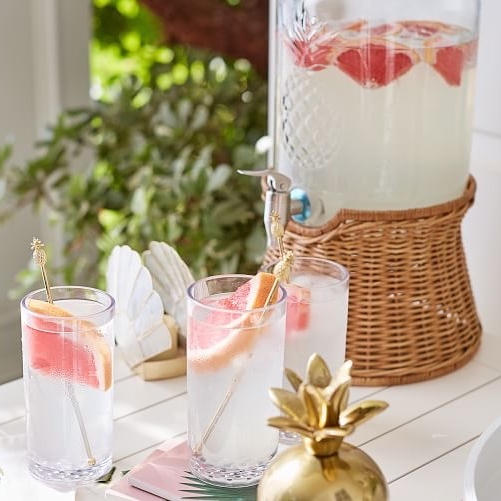 And, this Willow Wicker Drinks Dispenser by Pottery Barn is on sale and priced to move!! I grabbed three because water, tea, and batch cocktails. Also, I was afraid one might eventually break and I would be so sad to not have at least a pair any more. P.S. You have to purchase the drinks dispenser separately. There are a million options at Amazon, like this one.